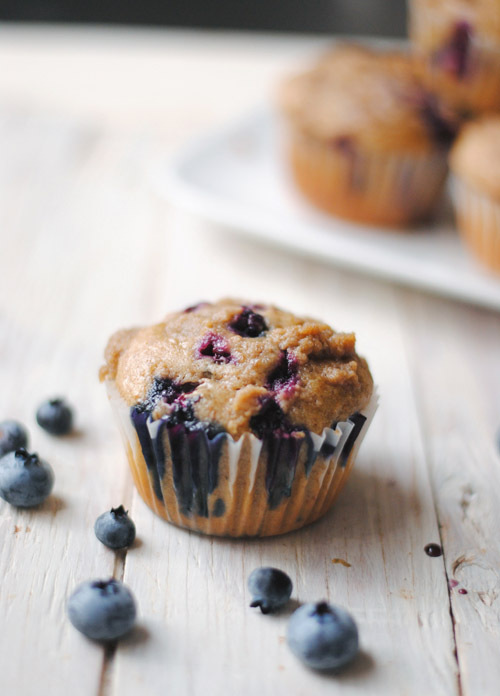 Hands down the best blueberry muffins I've ever had. I really wish I had doubled the recipe for these Blueberry Crumb muffins. They went faster than my Peanut Butter Banana Chocolate Chip Muffins (if only because there weren't as many). They're so tasty-- incredibly moist and tender, and the crumb topping adds the perfect sweetness. I used whole wheat flour, and threw in an extra few raspberries, and they were still delicious. I find sometimes recipes don't hold up the same taste-wise with WW, but not these babies. They were so good, I'm tempted to make an extra batch of them today. They want you to eat them, okay? Preheat the oven to 375F and grease or line a muffin tray. Make the crumb topping by combining all the ingredients in a small bowl, and blending with your fingers or a fork until it resembles small pebbles. Set aside. To make the muffins, combine the flour, baking soda, baking powder, salt, and cinnamon in a large bowl. Whisk once or twice to blend. Set aside to hang out with the crumb mixture for a little bit. In a small bowl, toss the berries and flour until the berries are evenly coated. In yet another bowl -- this one medium sized -- whisk together the oil, buttermilk, egg, and vanilla, then fold it into the dry ingredients until just combined. Gently stir in the blueberries. Scoop the batter into the muffin tins, and sprinkle with the crumb mixture. Bake for 15-20 minutes, until a toothpick inserted int he centre comes out clean.